2013 is an important year for one of the leading labels in electronic dance music as Armada Music reaches its 10-year anniversary and looks back upon a decade of music. '10 Years Armada' celebrates the feat, offering a unique collection of Armada's musical highlights, including tracks of Armin van Buuren, Motorcycle, Aly & Fila, W&W, Audien, Dash Berlin, Dubfire, Markus Schulz, Tim Berg, NERVO, BT and many more. Growing from a boyhood dream into an award-winning company, the Amsterdam-based record label has a very bright silver lining on the horizon. For the fifth year in a row, it has won the International Dance Music Award for 'Best Global Record Label', a sign of Armada Music's on-going growth, investing in the future and representing a strong variety in styles. In June 2003, Armada Music was founded by Armin van Buuren, Maykel Piron and David Lewis, as it kicked off with Motorcycle's 'As The Rush Comes'. A decade later it's featured on the anniversary album, along with many other big classics and must-haves, commemorating 10 years of dance music. 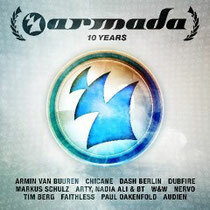 '10 Years Armada' takes you on a musical trip, from the early classics of Origene, Questia, Signum, Binary Finary and Chicane to the modern sounds of Armin van Buuren, Way Out West, Faithless, Nadia Ali, Orjan Nilsen, Tim Berg, Shogun and Antillas. It’s out now, check the mini mix below.